Will we call it Air View? Google is collaborating with San Francisco–based, pollution-tech start-up Aclima to begin assessing air quality in metropolitan areas across the United States. Cars Google uses to capture its popular Street Views have been equipped with Aclima’s environmental sensors and will be able to detect pollutants such as Methane, Carbon Dioxide, and Black Carbon. In a test drive back in August 2014, three Google cars equipped with these sensors collected 150 million data points after driving 750 hours around Denver. 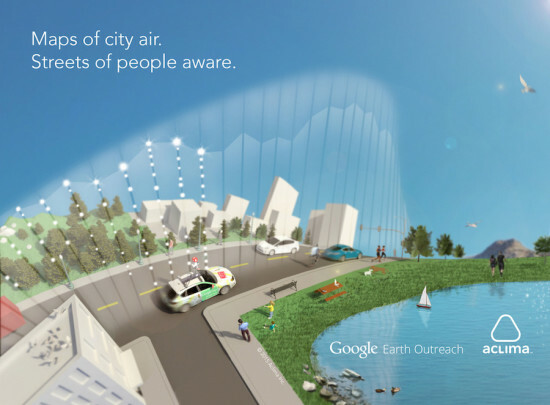 The study, conducted by NASA and the EPA, successfully mapped the change in outdoor air patterns and has confirmed the effectiveness of mobile sensing.”We have a profound opportunity to understand how cities live and breathe in an entirely new way by integrating Aclima’s mobile sensing platform with Google Maps and Street View cars,” Aclima CEO and co-founder Davida Herzl said on the company’s blog. The Aclima–Google Street View cars are said to be maneuvering around the Bay Area next. They will eventually branch out to other cities to collect data that could help create healthier cities for people to live in. In the future, Aclima hopes to make the data accessible to the public.